While flipping through our stack of Cooking Light magazine’s wondering what to make for dinner, we came across this Chicken Verde Stew with Hominy recipe — and since we absolutely love tomatillos and can’t seem to get enough of them — this is what we were gonna make. While our tamatillos and anaheim chiles were beautifully blackening in the broiler, we got everything else ready so we could start cooking pronto. When it was done we topped each bowl with a squeeze of fresh lime, a sprinkle of chipotle pepper and chopped cilantro. Each hearty bite was loaded with wonderful texture, tangy, smoky flavors with a hint of sweetness and spice. A dynamite dish that left our tastebuds dancing in perfect 'hominy' over this heaping delight! We had a friend from Maine for dinner over the weekend, fresh off the east coast. He took a hot bath and headed straight to the dinner table, literally! Yes, we finally did it, we always thought about cooking a live Maine lobster but just never got around to it. He weighed about 1 1/3 pounds and as he rode home with us, we were hoping we had a big enough pot. Turned out our Le Creuset French Oven worked just fine. We decided to keep it simple and let our crustacean friend do the flavor talking, served with a side of melted butter lemon dipping sauce and garnished with fresh dill. The texture was firm and the meat had a light sweetness made lustrous from the velvety citrus glaze. Also on stage was a heaping bowl of Mussels and Clams soaked in a saffron-infused white wine broth. We followed this Epicurious recipe and tweaked it by adding clams and substituting light coconut milk for the cream. The marriage of flavors proved to be divine, elegant, smooth and creamy. The mussels and clams were cooked to perfection, and the alluring coconut saffron broth radiated exoticness found only in a far away land. This dynamic dinner duo made our taste buds raise the white flag with gusto, surrendering to this powerful force of lusciousness. It’s been awhile since we’ve made ceviche, and after reading great reviews about Sun Fat Seafood Co, a market in the mission known for it's fresh seafood at wholesale prices, we decided to buy the star ingredient there. Once inside we realized the prices really were too good to pass up, so we bought generous size portions of salmon and tilapia along with stripe bass for our ceviche. As we left we were kicking ourselves for not discovering this place sooner! With all this great seafood on hand we couldn’t wait to start prepping our seafood supper — Mango Ceviche and Spiced Tilapia with Roasted Pepper Tomatillo Sauce. The ceviche recipe called for halibut, and since Sun Fat didn’t have any they recommended stripe bass. Let us just say this was a standout meal we will never forget. It tasted like it came from a high end restaurant. The ceviche was wonderfully textured, the firmness of the fish and crunchiness of the red onion was in a tasty tug-o-war with the smokey chipotle and the fresh parsley/cilantro blend. The tilapia was perfectly moist and flaky with a punch of zestful tomatillo zing. The ying and yang characteristics between the rice vinegar and honey rounded out the sweet and velvety swim across the strait of seafoodliciousness to our eagerly awaiting taste buds. Needless to say our taste buds were slapped silly with sensational goodness — an unforgettable meal we look forward to eating again very soon! Craving mexican but feeling lazy — we made our own salsa to go along with chicken soft tacos, and washed it all down with a dang good margarita. 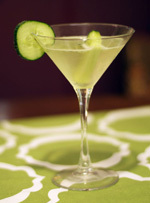 A perfect blend of muddled kiwi and cucumber with a dash of jalapeno spice — ummm umm delicious! What a great weekend we had! The weather was nice, so we decided to kick off Saturday with a hike up in Mount Tamalpais, where we enjoyed wonderful views of the bay as we hustled our muscles to The West Point Inn, which was our turn around spot. The inn is simple and rustic with panoramic views of the bay, and from April - October they have monthly Sunday pancake breakfasts, which can be a nice treat after a hike or bike ride on the many trails through the mountain. Afterwards we had lunch at The Mountain Home Inn, another charming inn located in Mt. Tam with sweeping bay views. Unfortunately for us there was no outside dining available without a long wait, so we sat at the bar and had ourselves an overpriced, barely mediocre lunch. We'd go back for drinks and the view, but that would probably be it. Saturday night we had dinner reservations at Garibaldi's for our early valentine's dinner celebration. We've heard so many great things about this Presidio Heights gem, and since we've never eaten there before, we thought it would be the perfect spot for a nice, romantic dinner. And boy were we right! The atmosphere was lively, stylish and sophisticated and the food was absolutely wonderful! We loved every bite — from the risotto croquettes, pickled baby beets, roasted brussel sprouts with apples, pan roasted loch duart salmon and incredible lamb tenderloin — our tastebuds will be fantasizing about those dishes for a long time to come. A very memorable and romantic dinner we look forward to enjoying again! We love a good seafood risotto, so when we came across this Lobster Risotto recipe in Cooking Light magazine, we just had to try it. We decided to use langostino tails instead of lobster tails for an easier, less expensive alternative. Langostino has a similar taste and texture to lobster meat, although it’s a different type of crustacean, a little tiny thing no longer than 3 inches, and more closely related to porcelain and hermit crabs. This was our first time cooking with these babies and we couldn’t wait to take a bite! For extra creaminess, we added 1/4 cup fat free milk, and for more flavor we added 1 tablespoon thyme, 1 tablespoon fresh parsley, a pinch of truffle salt and a squeeze of lemon. What a decadent dish — the langostino was lovely with it's slightly sweet, tender and perfectly plump texture, the rice was cooked to perfection, the peas added nice pop, and with the truffle salt's wonderful earthy flavor — we had ourselves a bowl of velvety, zesty, 100% indulgence! Recently we bought the book New Flavors for Soups at Williams Sonoma, which features all sorts of interesting and delicious looking recipes using fresh, local and seasonal ingredients while combining global flavors. The book is categorized by seasons, with many dishes we can't wait to make and post on this blog. 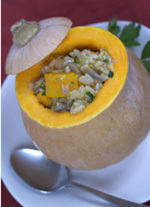 So we decided to kick-off our 2011 tastebud adventures to the country shaped like a boot, aka Italy. We selected a Beef and Mushroom Soup with Farro recipe, and in place of farro we used arborio rice to make it gluten free. We began by making our own beef stock, which took over 2 1/2 hours of careful nurturing in creating the backbone for this earthly wonder. This was the first time we've made our own stock and it was definitely well worth the wait. This soup was a kick in the palette pants chock-full of woodsy, earthy flavors, plump texture and meaty richness. It was a memorable hearty party indeed — one that we look forward to savoring again. 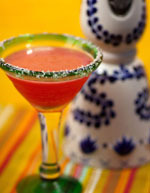 Looking for a standout cocktail to serve at your New Year's Eve party or your next cocktail soiree? Then look no further than the Bourbon Ginger Snap, courtesy of Real Simple magazine. This cocktail is quick and easy to make and downright fabulous — each sip bursting with the perfect blend of zesty, earthy, spicy fresh-flavored oh-la-la decadence. It will leave your non-bourbon drinking friends craving seconds (or more!) and your beer, wine and other boring cocktails jealous. These drinks pack a punch so try not to drink 'em too fast, although if you serve yours in tiny vintage cocktail glasses like we did, that will be hard! Things have been cooking on the computer instead of in the kitchen lately, and our dinners have become a bit boring to say the least. Besides prepping for my upcoming shows for my textile business, I’ve been designing new patterns as well as invites for pingg and photocards for snapfish which I absolutely love, but by the time dinner comes around I’m pooped! For the last few months our tastebuds have befriended stir-frys, pastas, salads, chicken and burgers, so for this weeks dinner we decided to break our dinner doldrums by making something different. This dish was easy to make, ready in no time, and very tasty! The soup was wonderfully creamy and velvety sweet, with a subtle kiss of ginger, saffron and curry flavors. The scallops were perfectly tender and tasted like plump bites of heaven, while the snow peas and mushrooms added nice crunch, earthiness and lovely texture. And for extra kick, we added a squirt of Sriracha Hot Chile Sauce to each bowl. 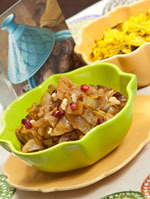 A hearty, comforting bowl of exotic goodness that we look forward to eating again! We love cooking with pork, not only because it’s perfect for grilling, it’s lean, juicy and works well with a variety of marinades and seasonings. So after searching online for an interesting recipe, it was this Fig and Chile-Glazed Pork Tenderloin from Cooking Light that tantalized our tastebuds. We’re seeing figs used in a lot of unique dishes and cocktails these days, and since we love the taste, we were really looking forward to this meal. This recipe calls for fig preserves, and we used this quick and easy recipe by Emeril Lagasse on the Food Network website as a base, with a few of our own tweaks. For ours we cut the sugar down to ¼ cup, and added about a ¼ cup of water to reduce thickness, and 4-5 tablespoons of bourbon. For an extra kick, we used the flavor injector filled with approx. 2 tablespoons of bourbon to marinade the pork minutes before grilling. We served collard greens as a side from Trader Joe’s, and washed it all down with our own Fig Sidecar. Wow — we felt like we were eating a gourmet celebration dinner with this super-tasting meal. The pork was cooked to perfection, very tender and juicy with it’s charred outer crispiness that we love so much. The fig sauce was absolutely divine — an amazing luscious and savory blend of tangy, zesty, smoky, sweet, and woody flavors that intensified after each blissful bite. By all the oohhhing, uummming, and aahhhing being said, our neighbors probably thought that someone was getting porked! Actually it was our tastebuds getting porked, and we loved every bite of it!! For our Fig Sidecar, we added two heaping tablespoons of the leftover fig sauce to an ice-filled martini shaker. Then added two shots of bourbon, and two shots of our very own date and raisin infused bourbon that we had on hand. Toss in a tablespoon of bitters, a squeeze of one juicy lemon, and a splash of orange juice. Shake like crazy, pour into a cocktail glass, garnish with a few peach slices, and get ready for a fabulously tasty (and potent) treat! Feel free to reduce the bourbon if you like less kick.